Fans of the upcoming 2013 SRT Viper GTS got to take a good look at it over the weekend. The viewing public got a sneak peak at the Viper Sunday at the Pebble Beach Concours d’Elegance. The Sacramento Bee has the run down of the new car. The design is a blast from the past with the Viper Coupe having a GTS Blue pain and dual Bright White stripes giving the Viper an iconic look and styling that reminds drivers of the Vipers of yester-year. 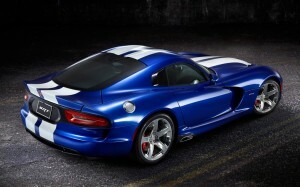 The Viper will be making its comeback the fourth quarter of 2012. It’ll have a host of new features and plenty of options to compel buyers to jump back into the driver’s seat. That includes a 8.4 liter V-10 engine that gives 640 horsepower and 600 lb-ft of torque. That’s the most torque of any sports car engine in the world. That’s all on top of the 5-spoke polished forged-aluminum design of the wheels. The exterior is made of an all-new carbon-fiber aluminum skin that is made especially for high-speed stability. The new Viper seems like a dream come true to the people who have been waiting for its return. For more information on the vehicle and to see how you can give your car a new look inside and out, go to Bayside Chrysler Jeep Dodge and check out the Mopar E-Store. Make sure that you give us a like on Facebook and follow on Twitter for more information on the Viper and Mopar.